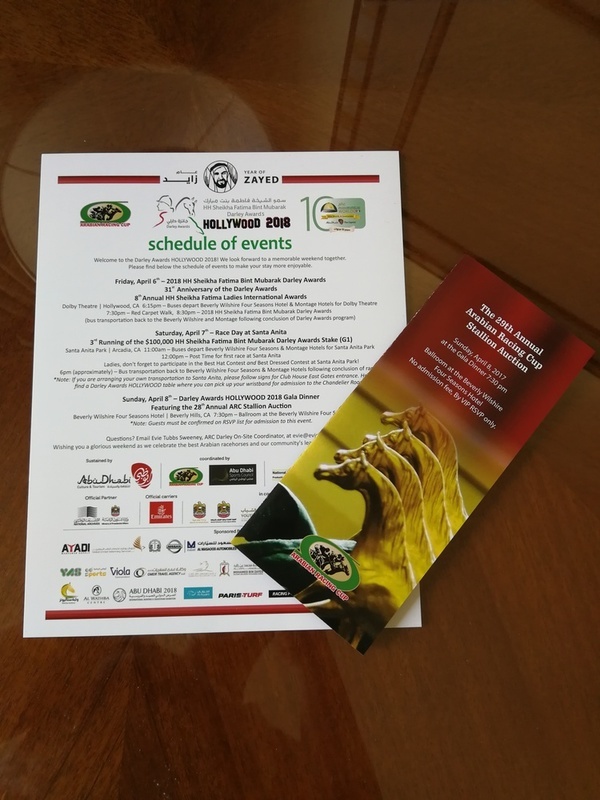 We will be following all the action from California this weekend as the who’s who of Arabian racing descend on Hollywood for the H.H. Sheikha Fatima bint Mubarak Darley awards and the US Darley Awards which recognise outstanding achievement in Purebred Arabian Racing and Breeding. 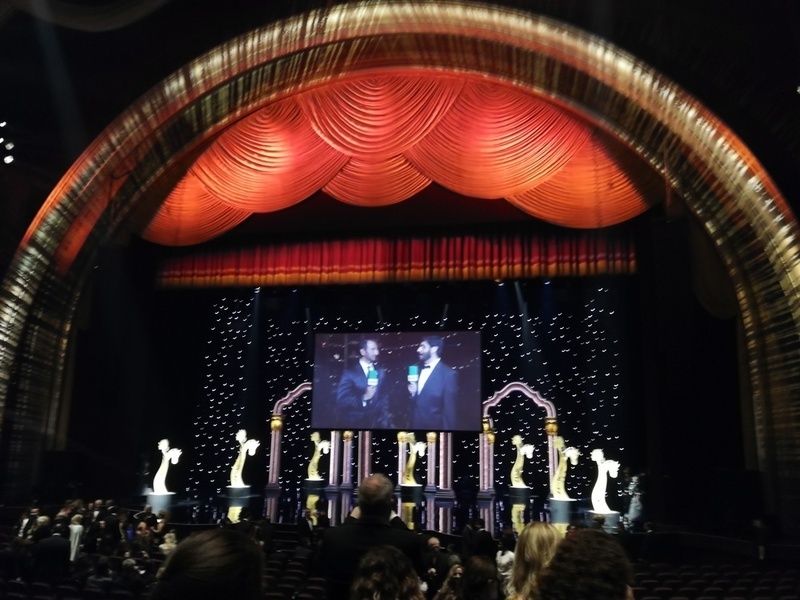 These awards are sponsored by the HH Sheikh Mansoor bin Zayed Al Nahyan Global Arabian Flat Racing Festival and will be held at the Dolby Theatre, home of the Oscars. Lara Sawaya, the Executive Director of the festival, President of the International Federation of Horse Racing Academies and Chairman of Ladies & Apprentice Racing Committee (IFAHR) outlined the schedule for the weekend with invitees also taking in the HH Sheikha Fatima bint Mubarak Darley Award Stakes (G1) at Santa Anita on April 7 and then a glamorous gala dinner and stallion nomination auction at the Beverly Wilshire hotel on Sunday evening. 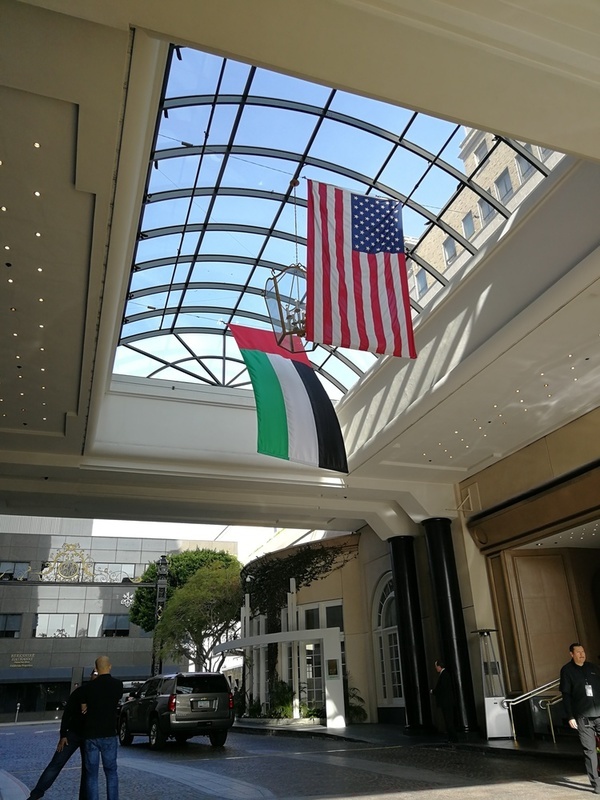 Hello and welcome to coverage of the HH Sheikha Fatima Bint Mubarak Darley Awards which take place at the Dolby Theatre in Hollywood at 20:30 PDT time. 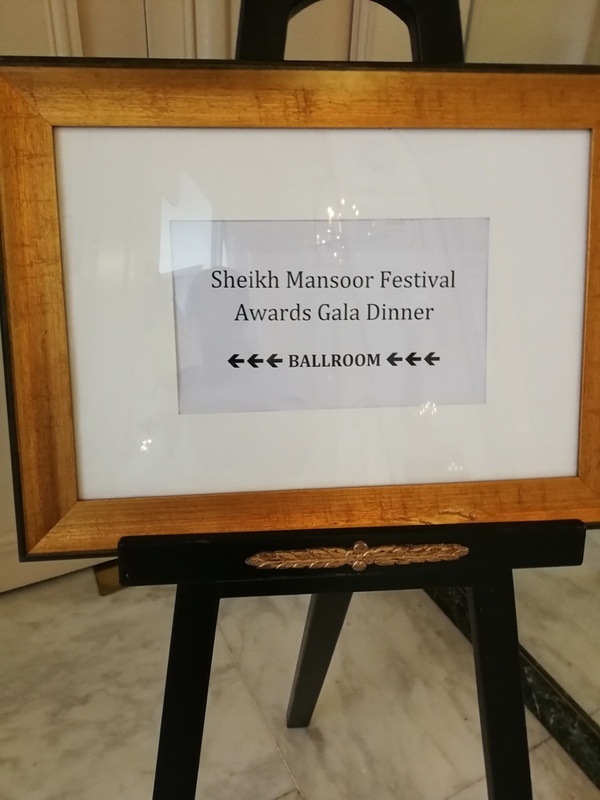 The event is set to be well attended by Arabian nations across the world and we'll be bringing you all the news from the awards as it happens tonight. We're all set at the Dolby Theatre to see who has scooped the coveted prizes at this year's Darley Awards. Guests arrived on a red carpet outside the Dolby where their pictures were taken in front of a year of Zayed motif before making their way into the legendary venue. The ceremony is honouring those who campaigned exceptionally throughout 2017 and each winner of the US Darley Awards, which take place before the International accolades, are given a golden horse. It is the seventh anniversary of the awards and this year's is extra special with them falling in the Year of Zayed. After a film produced by National Archives in Abu Dhabi celebrating the achievements of Sheikh Zayed is shown to attendees, we are ready for the first award of the evening for Three-year-old colts and geldings. Dianne Waldron's RB Hot Date, who has won several races, is crowned champion and Waldron said: "It's always a thrill, we keep being blessed. RB is a great colt and this is a great honour." Moving quickly onto the second award of the evening - Three-year-old filly - and that goes the way of Krista Henningsgard's Uptown Sandy Girl. Another award for Dianne Waldron as RB Nash lands the four-year-old colt and gelding accolade. He'll be running at Santa Anita in the Grade 1 Arabian race on Saturday and could add to the success that Waldron has had so far tonight. The four-year-old filly prize goes to Joe and Betty Gillis' Sweet Honey AA. The award is collected on behalf of the owner-breeders as they are unable to attend today's event. No surprise in the older horse category that Scott and Lori Powell's superstar Paddys Day takes home this award. 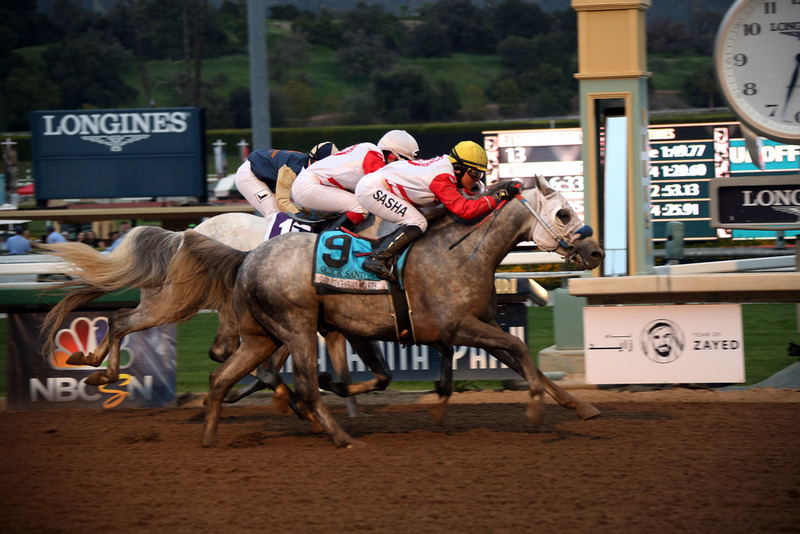 The seven-year-old is a multiple Grade 1 winner and is the first American Arabian horse to win over a million dollars in prize money. Scott Powell said: "He can't wait to get back to US soil. We're very proud of him and he's proved the quality of horse he is." Swiftly on the heels of the Powells' taking home the older horse award with Paddys Day, they also scope the older mare category with their Grade 1-winning daughter of Burning Sand - Ivory Sands. Scott Powell said: "She's a real special horse. She had some issues and problems; we were actually going to turn her out and breed from her. We were told by a lot of experts she wouldn't run again. I was stubborn and didn't agree with that so it took us a year and a half to get her on the track to see what she could do." It's another award for Joe and Betty Gillis this evening as they land breeder of the year and is recieved on behalf of the couple by trainer Jerenesto Torrez. Quickly followed by the couple also being named owner of the year. Torez makes a return to the stage and this time it's to collect an award presented to him - trainer of the year. He says: "It's great, I can tell you that too many times!" The final award in the US section of the Darley Awards is for jockey of the year and it goes to Keiber Coa who is best known for riding the likes of Paddys Day, Ivory Shores, RB Nash, RB Gaim Changer, RB Hot Date and Risky Red. For the first international award of the evening, best breeder, it goes to Betty Gillis and is picked up by trainer Terri Eaton. Best Owner goes the way of Oman resident Aisha Bint Yousuf Al Balushi. There's British success to be celebrated at this year's awards as Beverly Deutrom is named best trainer. Deutrom, who collects the award with her daughter, has a number of horses in training including Storm Troupour who has run three times and won once. Deutrom said: "It's fantastic. I'm honoured to be here. Thanks to Sheikh Mansoor and Sheikha Fatima for their support to allow me to race Arabians around the world." Natalia Hendzel from Poland is named the best professional jockey, Alice Bertiaux is the best amateur jockey and best apprentice jockey goes the way of Alexandra Bihari. Lifetime achievement honours those who have dedicated their life to Arabian Racing and this year's award goes the way of Val Bunting. Val was introduced to horses by her grandfather and to horse racing by her uncle. Having been gifted a purebred Arabian mare, Val fell in love with the breed and took out a trainers license to train Arabians in the UK. Her success as a trainer saw her head to Qatar, where she became leading trainer, before relocating her farm to France where she continues to breed Arabians. For the past 18 years she has has been racing manager, stallion manager and breeding advisor to Dr Mohammad Al Nujaifi - a partnership that is continuing to have so much success. Bunting said: "I really appreciate this award and want to thank everyone involved with Sheikh Mansoor and Sheikh Fatima. If it wasn't for these people we wouldn't have these awards." In her speech, Bunting dedicates the award to her late husband who is not able to share this wonderful piece of recognition with her. A trio of awards for those who have worked in the media to further the reach of Arabian Racing are up next. Best journalist goes to Evie Tubbs Sweeney, Best Racing Presenter is given to Amanda Roxborough and Best Photographer goes to Hedwig Irmingard Bourenane. Endurance rider Pilar Saravia, from Uruguay, becomes the youngest ever recipient of a Darley Award as she is named best endurance rider. Only 16 years of age, Saravia, is ranked as the number one endurance rider in the FEI rankings. Best filly three-years-old goes the way of nine-time winner Bint Grine. Best filly four-years-old is given to Muneera, who won the Group 1 PA Qatar Arabian Trophy des Juments at Chantilly last year and best older mare is named as Ivory Shores. Just one award left tonight and it's the big one - horse of the year. Can Paddys Day make it three wins in a row for the top honour at the event, let's find out! He's done it! Scott and Tori Powell's Paddys Day has beaten the rest of the nominees to land his third horse of the year award in a row. A global performer on the racing scene, he campaigned in Dubai last year, it seems there's no stopping this talented Arabian. Everyone involved with Paddys Day make their way onto the stage to collect the award and that concludes the evening! The action continues here at Hollywood today as we get ready for the Grade 1 HH Sheikha Fatima Bint Mubarak Stakes which take place at Santa Anita on Santa Anita Derby Day. 12 horses will go to post for this event and Uptown Sandy Girl, one of the award winners on Friday evening, will be hoping to cap off a great weekend for all her connections if she were to win this race. Dianne Waldron, who scooped two awards last night, is represented by RB Nash and RB Hocus Pocus while Joe and Betty Gillis have a trio of horses set to run in Quick Sand AA, Easter Man and Sand Victor. The contest will be the final race on the card at Santa Anita so stay tuned for updates throughout the day as this Arabian Grade 1 draws ever closer. 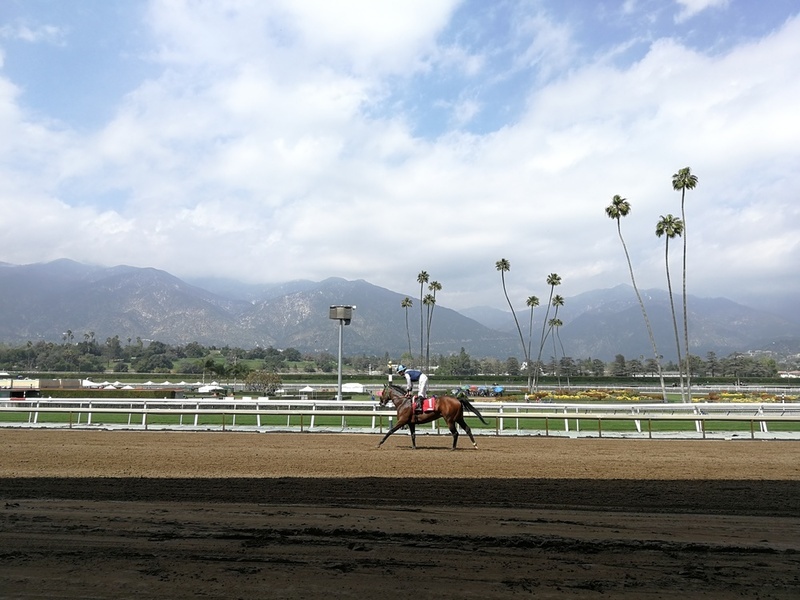 Hello and welcome to Santa Anita. After an overcast morning, the sun is beginning to make it's way through. The final race on the card is the one everyone is here for and is sure to be an interesting contest. Just two more races before the Grade 1 Sheikha Fatima Bint Mubarak Stakes. Easter Man finished second in this event last year behind Paddys Day and will be hoping to go one better this year. He was last seen finishing in a dead heat with Quick Sand AA for first in the Sheikh Zayed Stakes over seven furlongs at Sam Houston Race Park early last month. There's no doubt that these two will be the leading contenders in this year's contest. The final thoroughbred race here at Santa Anita has taken place and attention now turns to the Sheikha Fatima Bint Mubarak Stakes. Not long to go until this race gets underway. Horses have made their way into the paddock, less than 15 minutes until the final race of the say gets underway. The Arabian horses are approaching the gate, not long before the gates fly open and we find out who lands the Sheikha Fatima Bint Mubarak Stakes! And in a tight finish with three horses vying for victory, it's the Jernesto Torrez-trained Quick Sand AA who strikes under a well-timed ride by Sasha Risenhoover. It caps off a fantastic weekend for Joe and Betty Gills who took home several awards at last night's Darley Awards. What an eventful day Saturday was with Quick Sand AA taking the spoils in the Grade 1 Sheikha Fatima Bint Mubarak Stakes. The photo below shows him in full stride as he gets the better of his stablemate Easter Man to cap off a great week for Joe and Betty Gillis. Final preparations are being made at the Beverly Wilshire Hotel ahead of tonight's gala dinner where guests who have been invited will be treated to another wonderful evening. Stay tuned for all that happens with the stallion auction this evening. Guests are gathering in the ballroom at the Beverly Wilshire Hotel ahead of the gala dinner that concludes the weekend of events celebrating the Darley Awards.